WASHINGTON An influential group of business CEOs is pushing a plan to gradually increase the full retirement age to 70 for both Social Security and Medicare and to partially privatize the health insurance program for older Americans. The Business Roundtable's plan would protect those 55 and older from cuts but younger workers would face significant changes. The plan unveiled Wednesday would result in smaller annual benefit increases for all Social Security recipients. Initial benefits for wealthy retirees would also be smaller. Medicare recipients would be able to enroll in the traditional program or in private plans that could adjust premiums based on age and health status. "America can preserve the health and retirement safety net and rein in long-term spending growth by modernizing Medicare and Social Security in a way that addresses America's new fiscal and demographic realities," said Gary Loveman, chairman, president and chief executive of casino giant Caesars Entertainment (CZR). Loveman, who chairs the Business Roundtable's health and retirement committee, said the business leaders will be meeting with members of Congress and the administration to press them to enact their plan. The proposal comes as Republican leaders in Congress are calling for spending cuts as part of an agreement to increase the government's authority to borrow. Treasury Secretary Timothy Geithner says the U.S. will exhaust its borrowing authority as soon as mid-February, raising the possibility of a first-ever national default. President Barack Obama has said he is willing to negotiate deficit reduction with GOP leaders but insists that those talks be separate from decisions to raise the $16.4 trillion debt ceiling. Obama has warned that if Congress does not raise the debt ceiling, the economy could crash and Social Security checks and veterans' benefits would be delayed. 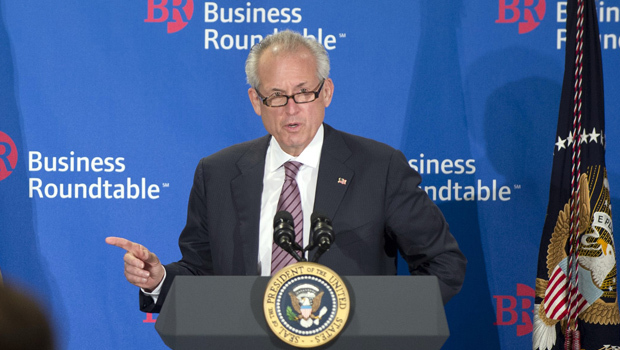 The Business Roundtable is an association of CEOs of some of the largest U.S. companies. Member companies account for nearly a third of the total value of the U.S. stock market, according to the group. The group has been an ally of Obama in the past, endorsing his proposal to raise taxes on high earners during negotiations over the so-called "fiscal cliff" in December. Obama has embraced some parts of the business group's plan for Social Security and Medicare, but he opposes any plan to privatize Medicare, and has backed away from his earlier support for raising the eligibility age. The proposal to offer private plans as part of Medicare is similar to a proposal by Republican Mitt Romney when he ran for president last year. Obama and Democrats in Congress campaigned against it, making it unlikely to pass any time soon. "These ideas were soundly rejected in the last election only a few months ago," said Max Richtman, president and CEO of the National Committee to Preserve Social Security and Medicare. The CEOs' plan puts them at odds with many groups that lobby on behalf of older Americans. In a speech this week, A. Barry Rand, AARP's CEO, denounced proposals to increase the eligibility age for Medicare, saying it would shift costs to employers, state governments and individuals. "This is pure folly and very dangerous," Rand said. Retirees can now get reduced Social Security benefits starting at age 62. Retirees must wait until they are 66 to get full Social Security benefits, a threshold that is gradually rising to 67. The eligibility age for Medicare is 65. The business group's plan would make unspecified accommodations for people with physically demanding jobs. Social Security and Medicare both face long-term financial problems as aging baby boomers reach retirement, leaving relatively fewer workers behind to fund the massive benefit programs. The trustees who oversee Social Security say the trust funds that support the retirement and disability program will run out of money in 2033, unless Congress acts. At that point, payroll taxes would generate only enough money to pay about three-fourths of benefits. Medicare is in worse shape. Its trust fund for inpatient care is projected to run dry in 2024, leaving the program unable to cover all its bills. "The facts are clear: If we want future generations to have access to Social Security and Medicare, America can no longer afford to wait," said Randall L. Stephenson, Chairman and CEO of AT&T (T). "The time to act is now." Adopt a new government inflation measure that would result in smaller annual increases in Social Security benefits. Make initial Social Security benefits more progressive by guaranteeing low-wage workers enough benefits to stay out of poverty, while lowering initial benefits for retirees with higher incomes. Require newly hired state and local workers to join Social Security. Some state and local agencies are not part of the system. Expand means testing for Medicare benefits so that wealthier recipients must pay more for services.